When someone is online, looking for "underground cable" or "thermo-insulated wire" or "wire harness", does your site pop up? Is it well-positioned when they look for your specific wire industry products? You may believe that your website is beautiful and informative, but does it appear when the engineer types in, "insulated multi-strand" or "custom harness clips", or have you created a beautiful, informative internet brochure that just sits in the back closet where no one can find it? A website that needs positioning is more the rule than the exception. Websites are built by website designers, who often understand design but not search engine optimization, two very different disciplines. It's the techies who feast on source codes who can get your website high in the rankings, where your customers and potential customers can find it. For most wire industry websites, the Google search engine is the leading driver of traffic. A full 70% of all new traffic starts with Google, and the chances are that if customers are not finding you on Google, they are not finding you. You, or someone in your company, may be smart and technically adept enough to build the site and make it discoverable for someone looking for your products, but if someone is not looking specifically for your company, will that person find the site? Google changes its algorithm, the way it ranks websites, over 200 times per year. Do you or your in-house designee have enough time to keep up with the changes? Your time might be better spent overseeing the techie who spends his free time playing video games and browsing blogs about web positioning. The person who built your site could be your daughter, who is smart and capable, but maybe she really wants to concentrate on her degree, or her job, or her new baby. She's too busy for full-scale combat with everyone else seeking top spots on Google, where search engine optimization (SEO) is guerrilla warfare. Your role is really to find the right techie and know how to supervise that person. To do it well, you need to know the general topography of the battlefield and the right strategy questions to be asking. Paid Campaigns, the quickest way to improve search engine results. It can include sponsoring keywords, buying space (banners, skyscrapers, mini-skyscrapers, eNewsletter sponsorships, etc. ), buying premium positions in directories and buyer's guides, and buying backlinks from other sites. Organic Site Improvement. Organic positioning, or search engine optimization (SEO), is getting your site to show up near the top in unpaid search engine listings. Unpaid listings are the main body of listings, not the ads surrounding them. You don't pay Google or Microsoft for a good position, but organic improvements do cost in the work, money and patience necessary to improve the site to get the better position. Social media. Social media is hot in 2013. Do you need a Facebook page for your business? LinkedIn? Are you on Google Places? Should you go to the trouble of posting a blog? Should you spend the money to produce a YouTube video and embed it in your site? Whatever the answers are in 2013, they will be different in 2014. What ever happened to MySpace? This series won't make you a techie. It will, however, help you ask the right questions and give you enough background to make you dangerous. If you are a techie, it may remind you of some tricks you have missed. Of course, if you're a techie, you will probably also remind me of tricks I have not mentioned. 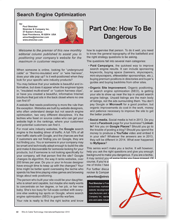 This is the first in a series of articles being published bi-mothly in Wire & Cable Technology. Part two is here. Check back soon for the next installment.